Clinical Pharmacokinetics. v.45, nº 5, 2006. -- p. 433-448. 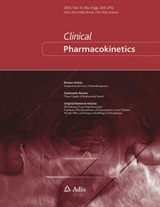 Fagiolino, Pietro, “The Influence of Cardiovascular Physiology on Dose/Pharmacokinetic and Pharmacokinetic/ Pharmacodynamic Relationships,” RIQUIM - Repositorio Institucional de la Facultad de Química - UdelaR, accessed April 23, 2019, http://riquim.fq.edu.uy/items/show/4.